In a powerfully compelling thriller that strikes at the heart of our current fears as a nation, Detective Jonathan Stride must investigate a marathon bombing in his city--before more people get hurt. On a rainy June morning, tens of thousands of people line the streets of Duluth while exhausted runners push to reach the finish line at the city's biggest annual event. Then, in a terrifying echo of the Boston bombing, there is an explosion along the race course, leaving many people dead and injured. Within minutes, Jonathan Stride, Serena Dial, and Maggie Bei are at work with the FBI to find the terrorists behind the tragedy. As social media feeds a flood of rumors and misinformation, one young man becomes the most wanted person in the city. And the manhunt is on. But are the answers behind the Duluth bombing more complex than anyone realizes? And can Stride, Serena, and Maggie find the truth before more innocent people are killed? A native of Chicago and longtime resident of the Twin Cities, Brian Freeman is an international bestselling author of psychological suspense novels. He is the author of Goodbye to the Dead, The Cold Nowhere, and Spilled Blood--which was the recipient of the Best Hardcover Novel in the annual Thriller Awards presented by the International Thriller Writers organization. Brian's debut thriller, Immoral, won the Macavity Award and was a nominee for the Edgar, Dagger, Anthony, and Barry awards for best first novel. Freeman lives in St. Paul, Minnesota, with his wife, Marcia. "A bomb along the Duluth marathon route sends Jonathan Stride sprinting into a media nightmare and an area manhunt. With strong characters and a propulsive plot, this thriller races to a breathless finish before truth becomes collateral damage." "Freeman delves into this community being pulled every which way extremely well, and delivers quite a shock before this fantastic psychological thriller comes to an end." "Just as in Boston, a bomb explodes at the finish line of the Duluth marathon - killing and maiming. Most people in Brian Freeman's Marathon assume it was a Muslim terrorist. But what if the jihadist didn't do it? A good read, albeit hugely disquieting." "Brian Freeman has his finger on the pulse of technology. His use of social media in Marathon feels so real that readers may find themselves searching the hashtags to make sure this is really fiction. In a time when even the simplest utterance can have global reach, Marathon exposes the dangers of such communication and the chain of events that can ensue." "Freeman has given us a book that couldn't be more relevant...an excellent look at the results of assumptions, ignorance, and prejudice. There are lessons to be learned here, including that freedom of speech can be an action with consequences as deadly as a bomb." "Freeman's character and plot development remain first-rate throughout MARATHON, and the continuing thread involving Stride and Serena should bring readers back for more." 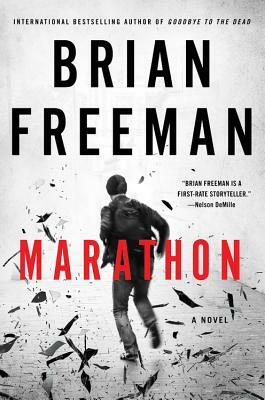 "While some may consider certain parts controversial, Brian Freeman does weave in a thought-provoking message into his fast-paced plot, making Marathon a solid thriller that most fans of the genre will enjoy." "Fast-paced . . . A reminder that, in these days and times, what seems to be foreign, politically, or religiously inspired terrorism may really be something quite different." "Freeman's Marathon is a firecracker that doesn't exploit the headlines as much as blows them apart and delves into the topics that really matter - all within a story that never lets up...what could have been a simple, reactionary page-turner became something special here." "Brian Freeman's excellent police thriller Marathon is so tragically timely, as we're constantly blasted with heartrending news of terrorist atrocities around the world. The novel - and what's been happening - made me think of Mahatma Gandhi's well known words 'An eye for an eye and the whole world is blind' as Freeman's story explores cycles of violence and horrific damage incited by hate-mongering tweets." "[Stride] is in the company of Bosch, Thorne, Tennison, and Skinner, some my other favorite detectives time has not mellowed." "Goodbye to the Dead" delivers page-turning surprises and action . . . another winner from an author who, 10 years later, just keeps getting better and just keeps mastering and perfecting the art of the psychological thriller."